I am primarily an ecological storyteller. Using a combination of ethnography, feminist science studies, and creative methods, I assemble stories about the everydayness of toxicity: how pollution has inserted itself into daily life so that we have gotten used to it, treating it as a matter of fact rather than a matter of urgent concern. Environmental Studies at York University (2017). My dissertation, Chemical Intimacies and Toxic Publics, draws from an assortment of archival and everyday material (government reports, tourist guides, newspaper clippings, postcards, and children drawings) to delineate some of the situated politics of ambient toxins: detailing the diffracted pathways of poisonous chemicals emitted from specific heavy industries and imposed on specific fleshy lives and ecologies. 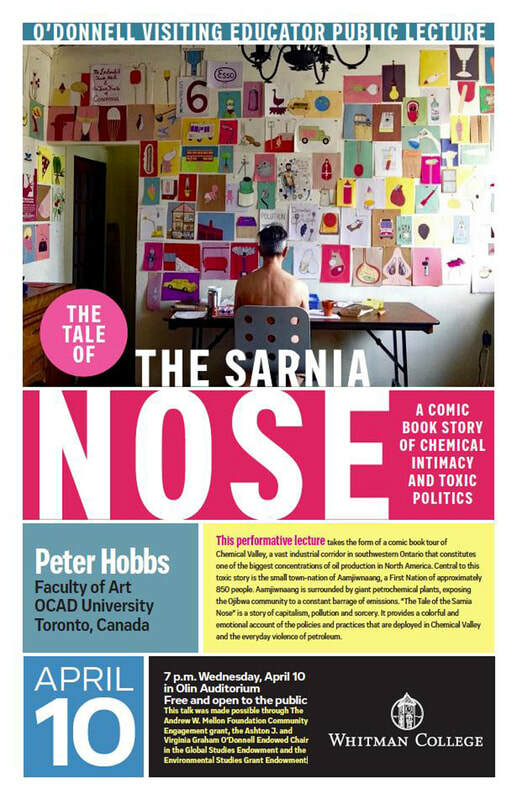 The focus is on two ethnographic sites and two polluting industries: Half of the dissertation examines the politics of lead in Toronto (tracing its lingering effects in two working class neighbourhoods), while the other half focuses on a massive petrochemical corridor that is located in and around the small city of Sarnia (in southwestern Ontario) and immediately adjacent to the First Nation of Aamjiwnaang. Chemical Intimacies and Toxic Publics traces the messy politics of ambient toxins, showing how people are always already entangled in the manufacturing and distribution of pollution. The text is a mixture of methods, concerns, and voices, and is meant to be read as part manifesto, part ethnography, part autobiography, and part art object. Chemical Intimacies and Toxic Publics was nominated for a York Dissertation Prize. I enjoy working collaboratively—finding friends and allies by pursuing forms of collective thinking and environmental activism. For example, in the photo on the right I'm leading a session of Toronto's Technoscience Salon, discussing citizen science and the use of air bucket brigades in Aamjiwnaang and Louisiana's Cancer Alley as an engaged and effective form of environmental activism.